Ballet master Stuart Sebastian raised his hand to signal the pianist to stop; at barre, more than fifty dancers instantly ceased moving mid-grand plies and looked around in unison to see what happened. Someone was attempting to sneak into class...late. I shuddered and breathed a sigh of relief; Thank God, it wasn't me, as I heard Stuart say in a restrained measured tone an octave above a whisper, "Don't you realize once the pianist's fingers touch the piano and plies begin, something spiritual is going on here?" 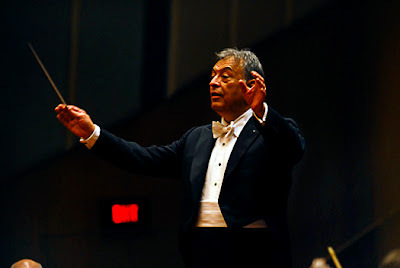 My ballet teacher's words rang in my ears as I and the rest of the audience sat up a little taller when maestro Zubin Mehta walked onto the stage of the New York Philharmonic. We exploded in thunderous applause to welcome our former director, then sat spellbound by the mesmerizing movements of his baton (as well as the lyrical sway of his body) as he lead the orchestra in sublime music by Avner Dorman and Bartok (something new and something old). Percussion Duo Tomer Yariv and Adi Morag (PercaDu) created their own unique magic as they shuttled with acrobatic skill between marimbas, vibraphone, tom-toms, wind chimes, tambourines, cymbals, darbukas (Turkish drums), floor toms, Arabic cow bell and kodo in a lively and spirited composition of Middle Eastern and Israeli music composed specifically for them by Avner Dorman called "Spices, Perfumes, Toxins!" After the performance, I navigated around the construction in the plaza of Lincoln Center with barely a notice, the smile on my face became ever wider as I savored what I had just heard. Something akin to the smile one has after a luscious truffle has melted on ones tongue. The evening still lives as a cherished memory. It may be awhile before Zubin Mehta returns to us, but don't let that stop you from experiencing your own enchanted evening, the Summer Festival at Lincoln Center has something special everyday from swing and salsa dancing in the plaza to International theatre and great music check Lincoln Center's website for details. Are you under 35? Don't miss an opportunity to take advantage of orchestra seats for $29 a ticket! Join MyPhil at the New York Philharmonic www.nyphil.org/myphil. Summer has a tendency to zip by in a flash, so it is not too early to mark September 12 on your calendar. The Philharmonic's new artistic director Alan Gilbert will open the season with an open rehearsal at 9:45 followed by events for kids of all ages and a concert in the evening. All free! Plan now to stop by and give our new maestro a warm New York Welcome. Enjoy a summer of wonderful music. Address to Remember: New York Philharmonic, Lincoln Center for the Performing Arts, Columbus Avenue 62-66th Sts., New York, NY 10023, 212-875-5000, http://www.lincolncenter.org/. Directions: From Times Square MTA 1 to 68th Street walk south to Lincoln Center.